We are really excited about our new blacksmith here at Chisholm’s Trail. We have upgraded our steel at no increase to our customers. The fit, finish, and price are on the par with any knife maker on the net. First is our new 6″ Bowie. It comes in both our “Drifter, Ranger, and Drover” styles and we can arrange just about any other sheath for it. The metal is (D~2) tool steel and the edge is perfect for cutting a T-bone steak or skinning a deer. We have left the anvil slag on the sides and polished it just enough to not be rough. It looks very frontier. The brass guards come from our partner foundry and are not made from melted down Chineese artillery shells. The handle material is American stag in both the hidden and full tang styles. Our next Bowie knife is 7″ and is made from the same rockwell hardness (D ~ 2) steel. The blade is a bit thicker and like its brother it is made to use on the trail or in the wilderness. We make this knife for our “Buffalo Hunter” sheath but can adjust our patterns to make any sheath fit. To get a closer look at any of our knifes just click on the photos on the knife page and the image will come in much larger for you to see. We have had a lot of requests for a replica of Val Kilmer’s gambler dagger in “Tombstone.” To coincide with the second printing of Peter Sherayko’s classic book “Tombstone- guns and gear,” we have reintroduced this dagger and sheath. However, instead of synthetic, our new handle is Ivory colored bone. This is not a toy, but a serious knife built to last. This is the only location to get this knife unless you want to contact the original maker Chuck Stapel. He will be glad to make one for you too. Many of our customers are looking for something different. According to them, spear point knives are hard to find so we are reintroducing our spear point Bowie. 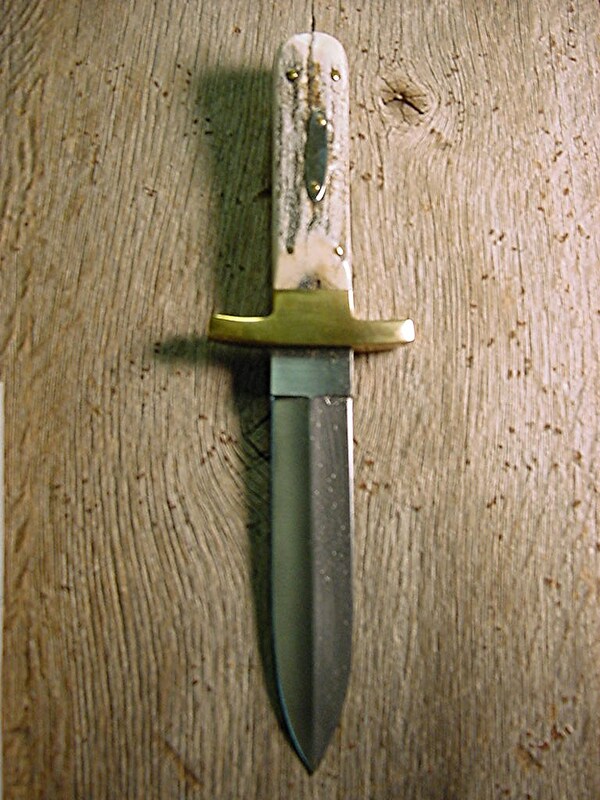 This one is similar to the George Wostenholm knives of the old west. 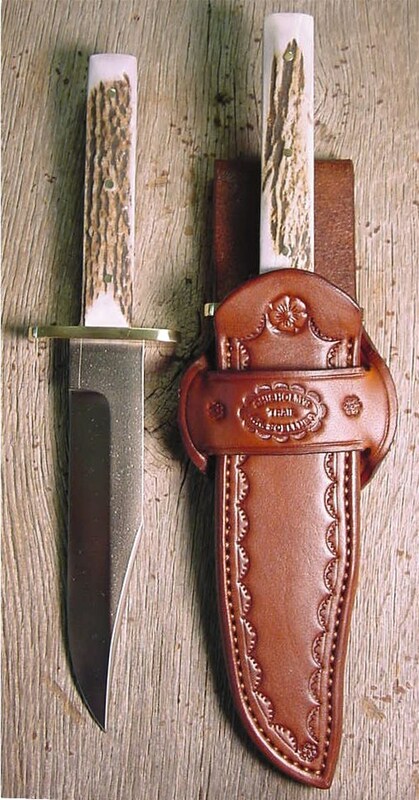 We use high carbon steel in the six inch blades and they are deeply stamped “Chisholm’s Trail.” The handles are all aged Sambar Stag and there is a small oval plaque for engraving if you desire. Both edges are sharp and we can adjust any sheath to fit this knife. These knives are all in stock and ready for us to make the sheath you want for them. Don’t forget if you have a knife of your own but want a better sheath we can fix that problem also. We hope you will take the time to view not only our knife button, but all the other authentic historical reproductions we have to offer. Remember if you don’t see what you want, give us a call and we might be able to make it. Have a great summer.